Put simply Colloidal Silver is a solution that can kill harmful germs & bacteria by binding to and destroying proteins. 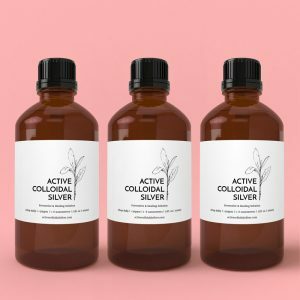 Colloidal Silver is a 100% natural, organic & vegan solution that can be used to heal infections such as colds and flu, cold sores, sinusitis, irritable bowel syndrome, diverticulitis, food poisoning, bladder and kidney infections, cuts, burns, infective dermatitis, athlete’s foot fungal infection, eye infections, yeast infections including candida and even HIV, norovirus, herpes & hepatitis. Colloidal in chemistry means a solution of tiny particles (usually at the nano level) that is mixed & suspended within another solution (i.e. the particles stay dispersed and not settle at the bottom or top). Therefor, Colloidal Silver is the use of nano particles of silver mixed & suspended in another solution, typically in water. 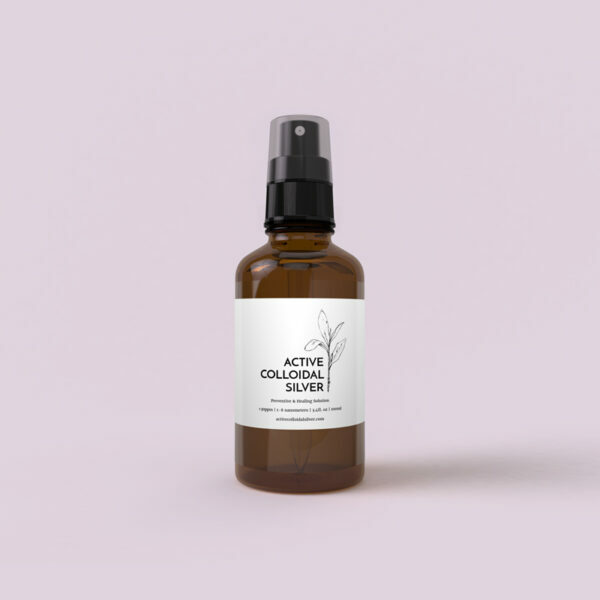 Our brand of Active Colloidal Silver begins with 100% Canadian Lake water, then purified further through reverse osmosis and finally mixed in with nano particles of 99.999% pure silver for over 24 hours in order to get over 30 PPM (parts per million). In a spray bottle it can treat the eyes, ears, under the tongue and the back of the throat for maximum absorption. New information suggests that many diseases such as diabetes, cancer, Alzheimers, MS may have a viral etiology and might benefit from a course of silver. Some experts consider silver and gold in trace amounts to be essential micronutrient minerals just like potassium, boron, calcium, chloride, chromium, cobalt, copper, fluorine, germanium, iodine, iron, magnesium, nickel, manganese, molybdenum, phosphorus, potassium, silicon, selenium, sodium, sulfur, vanadium, zinc. 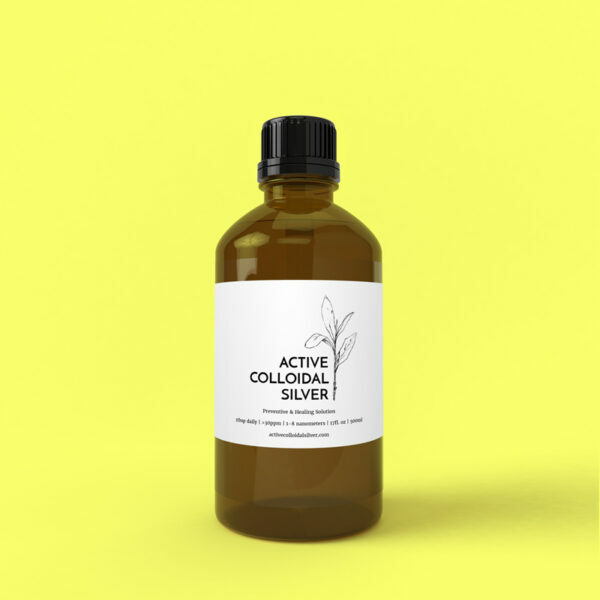 Colloidal silver is odourless, tasteless, non-stinging, harmless to eyes, contains no free radicals, is harmless to human enzymes and has no reaction with other medications. It improves digestion, aids in the regeneration of damaged cells and tissues, helps prevent colds, flu and organism-caused diseases. Normal use of colloidal silver does not harm the beneficial bacteria in our intestines. Colloidal silver has been tested and shown to be effective against more than 650 types of disease-causing pathogens. None of these organisms were found to survive in the presence of minute amounts of silver. Colloidal silver is known as an immune enhancer. It works by disabling the oxygen-metabolizing enzyme that one-celled bacteria, fungi and viruses use to reproduce themselves. The disease-causing pathogen therefore suffocates, dies and is eliminated. Resistant strains have never been known to develop, unlike anti-biotics, which are effective against only about a dozen forms of bacteria and fungi, but never against viruses. EPA (CASRN 7440-22-4) established that it is safe to ingest a daily quantity of 350 micrograms. This is equal to one ounce (30 mL) or six teaspoons of 10 ppm colloidal silver. Silver has been used for thousands of years in alternative healing practices and in Eastern medicine, but “when antibiotics were discovered, clinical uses for silver as an antibiotic were discarded.” says Dr. Robert O. Becker, MD and pioneering researcher. Today’s advanced nano-technology offers the best all-around ’silver’ germ fighter we have! Silver has the chemical symbol Ag (from Latin: argentum) and is a metallic chemical element with atomic number 47. As a soft, noble metal, it has the highest conductivity of any element, which has a stimulating effect on the electrical functions in the body. There is no corrosive silver nitrate or other salts of silver in Active Colloidal Silver which is non-toxic to humans and animals but highly toxic to bacteria, fungus and viruses. Based on the EPA toxicity categorization of antimicrobial products that ranges from Category I (high toxicity) down to Category IV, at effective trace dilutions of 0.1 ppm, Active Colloidal Silver is rated in the lowest toxicity category, IV, while traditional disinfectants fall into Categories I and II. The FDA admits it has no clinical data suggesting colloidal silver is unsafe for human use, with no deaths, no allergic reactions, no harmful drug interactions when combined with OTC and prescription drugs, no argyria when properly made. Silver as an alternative to chlorine in swimming pools has been approved by the EPA and NSF. The World Health Organization’s (WHO) guidelines for drinking water quality are defined for corrosive silver nitrate rather than silver nanocrystals state that, “where silver salts (silver nitrate) are used to maintain the bacteriological quality of drinking-water, levels of silver salts up to 0.1 mg/liter (0.1 parts per million) can be tolerated without risk to health.” Silver nanocrystals, in contrast to silver salts, have no known upper safety limit. Silver is regulated by US Environmental Protection Agency (EPA) National Secondary Drinking Water Regulations where secondary maximum contaminant allowed level of silver nitrate in public water supplies is 0.1 mg/liter, which is a non-enforceable guideline based on possible cosmetic effects, such as skin discoloration. The FDA granted approval in October 2003 for the use of silver in the food industry to treat surfaces and equipment used in food processing. Silver will greatly reduce bacterial growth, even under the most challenging food processing conditions. Hospitals employ silver as a bactericide and algaecide, while NASA also chose silver in their water purification systems. Silver also has a variety of uses in pharmaceuticals. In fact, silver is applied in the eyes of newborn babies and silver sulfadiazine is used on burn victims to kill bacteria and allow the body to naturally restore the burn area. When used externally, apply directly to cuts, burns, cold sores, open sores and other lesions. Dab on eczema, mosquito bites, acne and dandruff. Spray on athlete’s foot, use as a gargle for sore throats, or as a mouth rinse. Spray on diaper rash. Use as drops in the eyes and ears. Colloidal silver is equally effective for pets against bacterial, viral and fungal infections. It supports the immune system, protects against parasites, as well as keeping skin and fur healthy. Disinfect pet surroundings, dog and cat houses, litter boxes, food and water bowls, bird cages, etc. Silver has been known since ancient times and is mentioned in the Book of Genesis. While silver’s importance to health has been documented now, its benefits have been known for centuries. Early records indicate that the Phoenicians used silver vessels to keep water, wine and vinegar pure during their long voyages. People used ‘silverware’ as spoons, knives, plates and cups, until stainless steel replaced its healthier predecessor. American pioneers added pure silver and copper coins to their water barrels to keep them clean. The phrase “born with a silver spoon in his mouth” is not a reference to wealth, but rather to health. In the early 18th century, silver pacifiers found wide use in America and babies who were fed with silver spoons showed beneficial health effects. Atomised trace amounts of silver has a long history of successful use against most forms of microbes, dating back for thousands of years to ancient Greek and Roman times. European aristocrats ingested trace amounts of silver from their silverware thus providing resistance to plague, smallpox, polio, pneumonia and other serious infections. Modern day Indians eat silver foil in their food. Its new modern more purified form has been demonstrated by controlled scientific clinical studies to be safe and effective with oral ingestion and to often bring about dramatic improvements in cases of bronchitis and pneumonia. Anyone with a serious infection whether respiratory, GI, bladder or skin should have an opportunity to try orally good quality silver mineral water which contains trace amounts of silver atoms and which inactivates most bacteria and viruses. Most versions, commonly called Colloidal Silver and sold in many health stores, do not have the Zeta Potential or ppm or smallest atomic cluster size of less than 10 nanometres to be effective against the most vicious viruses. Users should ensure that the product has been verified by an independent lab or buy their own generator. Our Hamilton-based research company, Biophysica Inc. is the only one to have verified the quality of our Active Colloidal Silver by independent electron microscope examination and Zeta Potential measurement. Of these, Zeta Potential is likely the most important property affecting efficacy. Silver in trace amounts is one of the safest, most effective internal and topical antimicrobial substances known and is now being included in drinking water, beverages, swimming pools, bandages, respiratory masks, spinal implants, urinary catheters, food containers, children’s toys, toothpaste, paints, and in plastic tubing for dairies and breweries to prevent biofilm. 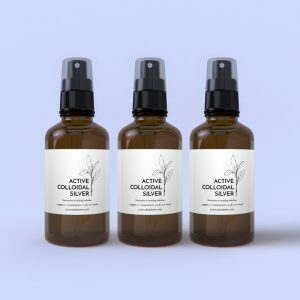 As a complementary antibiotic, colloidal silver is known to kill most organisms without side effects or harm to humans, animals or plants, and also promotes wound healing, tissue growth and immune system boosting and prevents biofilm formation in cystitis. Silver is the only safe, effective antiviral and has been shown to be effective against nearly 650 different disease-causing organisms. In trace amounts it is non-toxic, non-addictive, free of side effects and will not develop silver-resistant organism strains. Active Colloidal Silver is manufactured from R.O. or distilled water into which trace amounts of silver atoms have been electrolytically etched from pure silver electrodes using a spectrum of high frequencies matched to silver and which ensure the highest Zeta Potential and ensure that atoms remain separate while leaving the Anode rather than agglomerating into ineffective clusters over 10 nm in diameter. No intermediate chemicals are used. It is different, purer and far more effective than previous crude forms (called Colloidal Silver) containing salts, protein and other stabilizers and contains permanently suspended ultramicroscopic silver atom particles and is the purest, most effective colloidal Active Colloidal Silver available today. It has been approved in Canada only for topical use but is used orally as a remedy and in drinking water in many other countries. The unique electrical charge (Zeta Potential) applied to the silver ion in Active Colloidal Silver allows the silver ion to remain in solution because of mutual repulsion of the atoms, while at the same time making it more bio-available for antimicrobial action. Active Colloidal Silver in trace amounts kills microorganisms by two modes of action: 1) the silver ion deactivates structural and metabolic membrane proteins leading to microbial death; 2) the microbes view Active Colloidal Silver as a food source, allowing the silver ion to enter the microbe. Once inside the organism, the silver ion denatures the DNA, which halts the microbe’s ability to replicate and leads to its death. 3) Zeta Potential electrical charge on each nanocrystal has important effects by unknown mechanisms. This triple action makes Active Colloidal Silver highly and quickly effective against a broad spectrum of microbes. “Even Carbons Have a Silver Lining: Silver impregnated filters offer extra protection against bacteria”, Bayati, M. A. 1997. Water Technology, July, 1997. “Experience With Low-Current Silver Electrode Treatment of Nonunion,”, Becker R. O., et al., in Electrical Prop. Bone & Cartilage (ed. C. T. Brighton, et al. ), Grune & Stratton (1979), USA. .
“Treatment of Orthopaedic Infections With Electrically Generated Silver Ions”, Becker R. O., et al., J. Bone & Joint Surgery, vol. 60-A, pp. 871-88 (1978). USA. .
“The End of Antibiotics”, Begley S. (1994) Newsweek, Mar. 28, 46-51. “Antifungal Properties of Electrically Generated Metallic Ions”, Berger T. J., et al., Antimicrob. Agents & Chemother., vol. 10, pp. 856-860 (1976). USA. .
“Electrically Generated Silver Ions: Quantitative Effects on Bacterial & Mammalian Cells”, Berger T. J., et al., Antimicrob. Agents & Chemother., vol. 9, pp. 357-358 (1976) USA. .
“Silver Sulfadiazine: In Vitro Antibacterial Activity”, Carr H. et al (1973) Antimicrob. Agents Chemother. 4, 585-87. “The Bacteriological and Chemical Behavior of Silver in Low Concentration”, Chambers, C. a. C. P. (1960). Cincinnati, OH, Division of Water Supply and Pollution Control, U.S. Department of Health, Education, and Welfare. “Inactivation of treponema Pallidum by Silver Sulfadiazine”, Chang T.-W. & L. Weinstein (1975) 7, 538-39. “Prevention of Herpes Keratoconjunctivitis in Rabbits by Silver Sulfadiazine”, Chang T.-W. & L. Weinstein (1975) 8, 677-78. “A mechanistic study of the antibacterial effect of silver ions on Escherichia coli and Staphylococcus aureus”, Feng, Q. L., J. Wu, G. Q. Chen, F. Z. Cui, T. N. Kim, J. O. Kim. 2000. J Biomed Mater Res, 52, 662-668, 2000. “Silver” in Handbook on the Toxicology of Metals, Fowler B. & G. Nordberg (1986) L. Friberg, G. Nordberg & V. Vouk, eds. Amsterdam: Elsevier Sci. Pub., Vol. 2, 521-31. “Swimming Pool Disinfection, An Evaluation of the Efficacy of Copper:Silver Ions”, Gerba, C.P., S.M. Kutz, L.K. Landeen, and M.T. Yahya (1989), (Journal of Environmental Health), 51(5):282-285. “Disinfection of Bacteria in Water Systems by Using Electrolytically Generated Copper/Silver and Reduced Levels of Chlorine”, Gerba, C.P., S.M. Kutz, L.K. Landeen, M.C. Messina, R. Schulze, and M.T. Yahya (1990), (Canadian Journal of Microbiology), 36(2):109-116. “Silver and Its Compounds”, Grier N. (1983) in Disinfection, Sterilization and Preservation, S. Block, ed., Philadelphia: Lea & Febiger, 380-428. “Inhibitory and Cidal Antimicrobial Actions of Electrically Generated Silver Ions”, Hall R. E., et al., J. Oral & Maxillofac. Surg., vol. 45, pp. 779-784 (1987). USA. .
“Argyria – The Pharmacology of Silver”, Hill W. & D. Pillsbury, , Baltimore: Williams & Wilkins, 1939. “Collosol Argentum and its Opthalmic Uses”, Legge Roe A. (1915) Br. Med. J., Jan.16, 104. “Individual and Combined Effects of Copper and Silver Ions on Inactivation of Legionella pneumophila”, Lin Y. E. , Vidic R. D. , Stout J. E. , and V. L. Yu, 1996 Water Research ol 30. pp. 1905-1913. “Intermittent use of copper-silver ionization for Legionella control in Water Distribution Systems: a potential option in buildings, housing individuals at low risk of infection”, Liu Z., Stout J.E. , Tedesco L. , M. Bouldin, C. Hwang, W.F. Diven, and V.L. Yu, 1998, Clinical Infectious Disease, Vol. 26, pp18-140. “Effectiveness of Silver Ions Against Cysts of Endamoeba Histolytica”, Newton W. & M. Jones (1949) 41, 1027-34. “Electrically Generated Silver Ions: Quantitative Effects on Bacterial and Mammalian Cells”, Powell J. (1978) “Our Mightiest Germ Fighter” Sci. Digest, Mar., 57-60. 19) T. Berger et al (1976) Antimicrob Agents Chemother 9, 357-58. “Silver Compounds” & “Oligodynamic Metals”, Romans I. (1954) in Antiseptics, Disinfectants, Fungicides and Chemical and Physical Sterilization, G. Reddish, ed., Philadelphia: Lea & Febiger, 380-428. “A Case of Puerperal Septicemia… Treated with… Collosol Argentum”, Sanderson-Wells T. (1916) Lancet, Feb. 16, p.258. “Electrochemical Ag+ for Preservative Use”, Simonetti N. et al (1992) Appl Environ Microbiol 58, 3834-36. “Antibacterial Effects of Silver Electrodes With Weak Direct Current”, Spadaro J. A., et al., Antimicrob. Agents & Chemother., vol. 6, pp. 637-642 (1974). USA. .
“Experience With Anodic Silver in the Treatment of Osteomyelitis”, Spadaro J. A., et al., 25th Ann. ORS Mtg., Feb. 20-22, 1979. .
“Some Specific Cellular Effects of Electrically Injected Silver & Gold Ions”, Spadaro J. A., et al., bioelectrochem. & Bioenergetics, vol. 3, pp. 49-57 (1976. USA. .
“Experiences of the first 16 hospitals using copper-silver ionization for Legionella control: implications for the evaluation of other disinfection modalities”, Stout J. E., Yu V. L. 2003. Infect Control Hosp Epidemiol. 2003 Aug;24(8):563-8. “The Molecular Mechanisms of Copper and Silver Ion Disinfection of Bacteria and Viruses”, Thurman R. & C. Gerba (1989) CRC Crit Rev Envir Control 18, 295-315. “Colloidal Silver in Sepsis”, van Amber Brown G. (1916) Am. J. Obstetrics, Jan-June, 136-141. “Swimming Pool Disinfection: Efficacy of Copper/Silver Ions with Reduced Chlorine Levels”, White Thomas J. , (Journal of Environmental Health ); 05-01-1999. “Antifungal Activity of Silver Sulfadiazine”, Wlodkowski T. & H. Rosenkranz (1973) Lancet, Sep. 29, 739-40. “Orally-Administered Silver Sulfadiazine: Chemotherapy and Toxicology in CF-1 Mice”, Wysor M. (1975) Chemother 21, 302-10. “Disinfection of bacteria in water systems by using electrolytically generated copper:silver and reduced levels of free chlorine”, Yahya MT, Landeen LK, Messina MC, Kutz SM, Schulze R, Gerba CP. 1990. Can J Microbiol. 1990 Feb;36(2):109-16. “Antibacterial efficacy of a colloidal silver complex”, Surg Forum. 1966;17:76-8. by Brentano L, Margraf H, Monafo WW, Moyer CA.